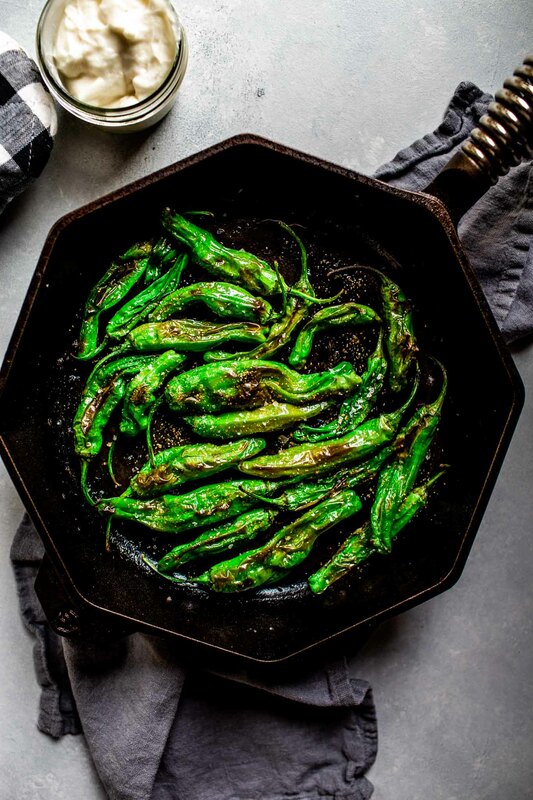 These Blistered Shishito Peppers are the perfect finger food. They’re so easy to make too. Lightly seasoned and slightly smoky, you’ll find that most are mild… one out of every ten might surprise you. My husband and I were out to eat at one of our favorite local restaurants, Radar. As is typical for us, we ordered several small plates so that we could sample it all – Oysters, Pork Shoulder, Bluefish Pate, Chicken Under a Brick, and of course, the peppers. Rick took one bite and his eyes watered up – “I’m not sure if I can eat this babe”. In the meantime, I had eaten three already and had to give him the look – “Are you crazy?” That’s when our waitress stepped up and asked – “How is everything? Did you get a hot one yet?” REDEMPTION. Shishito peppers are slender and wrinkly with thin-skins and a bright green color. 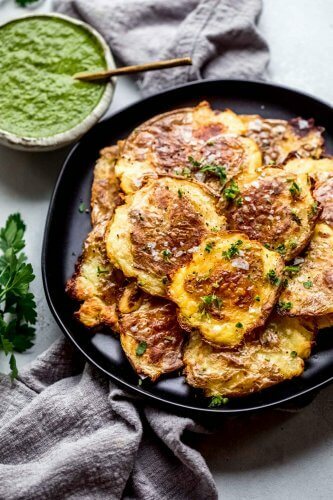 Slightly sweet in taste with a delicate texture, they’re like potato chips, you can’t eat just one! You can find these peppers in your local Asian market, farmers markets, and many grocery stores. My local Trader Joe’s just started carrying them as well *bonus* – Shishitos AND cheap wine!!! Shishito peppers a cinch to prepare. 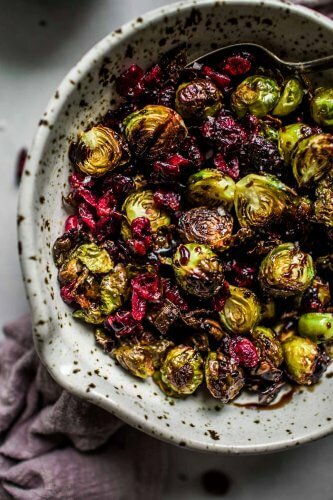 Just rub them with a little oil and toss them onto a hot skillet or grill to get them charred and blistered. Then sprinkle them with a bit of salt, plus any extra seasonings you might desire, and you’ve got the perfect finger food! In this version, I give the charred shishito peppers a sprinkling of togarashi. Togarashi is a Japanese red pepper blend. The exact spices used vary slightly by maker but usually include powdered/flaked red chili pepper, black pepper, sesame seeds, dried mandarin orange peel, nori seaweed flakes, hemp seeds and poppy seeds. It’s available in most Asian markets or online. It’s got a great unique flavor and is typically used to spice up Asian noodle and yakitori dishes. I also sprinkle on some lemon juice on the peppers for some added brightness. Shishitos are great to share at summer parties and barbeques. Grab the stem, pop the pepper into your mouth and enjoy! Heat a large skillet, grill or grill pan to medium-high heat. Arrange peppers in a single layer and cook until they are lightly charred. Are Padron and Shishito Peppers the Same? 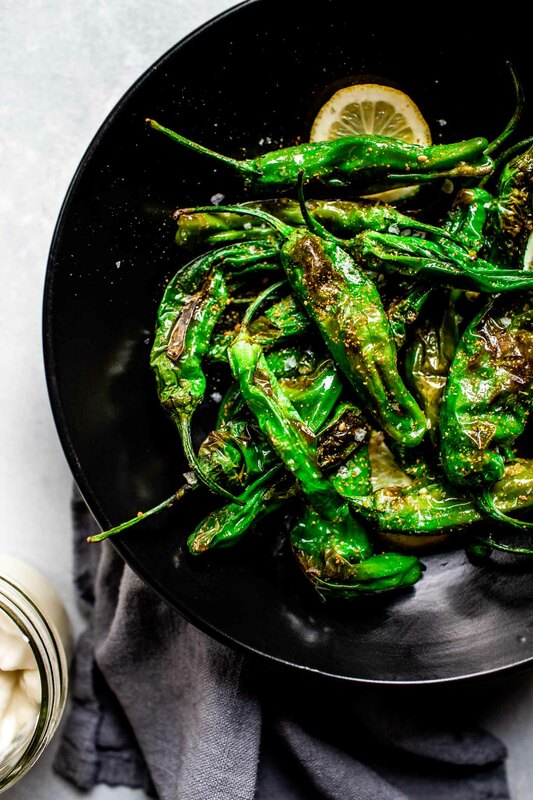 Shishito peppers and padron peppers are very similar. Shishitos are longer and narrower, while padron peppers are more round. Padrons can tend to be just a bit more spicy than shishito peppers. 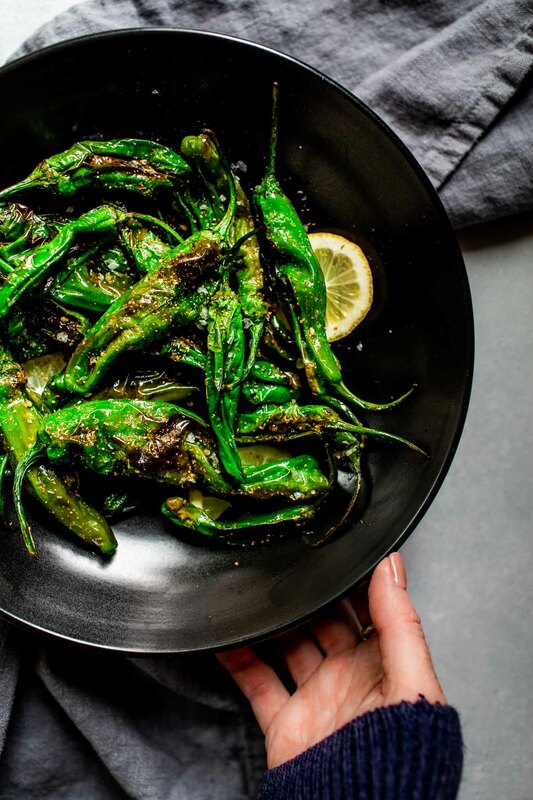 While about 1 in 10 shishito peppers will be spicy, about 2 in every 10 padron peppers will be spicy. What to Dip Shishito Peppers in? 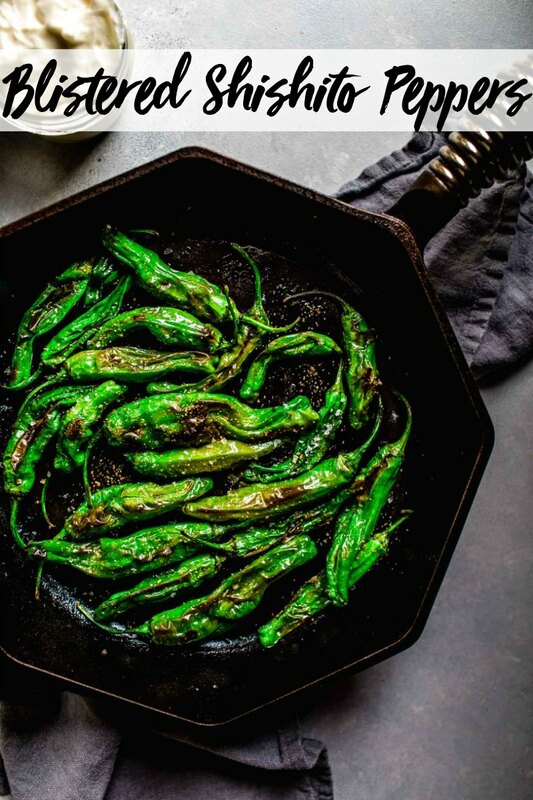 These Blistered Shishito Peppers are the perfect finger food. They're so easy to make too. Lightly seasoned and slightly smoky, you'll find that most are mild... one out of every ten might surprise you. Place the peppers in a medium bowl and toss with olive oil; set aside. When the skillet is hot, arrange the peppers in a single layer; reserve the bowl they were in. Saute the peppers uncovered, turning occasionally, until they charred and blistered, about 6 to 8 minutes total. Return the peppers to the bowl, and toss with togarashi and salt. Squeeze lemon over peppers, to taste. Serve immediately. If you loved this Shishito Pepper recipe I would appreciate it so much if you would give this recipe a star review! Also, be sure to snap a picture of your finished dish and share it with me on Instagram using the hashtag #platingsandpairings and tagging me @platingsandpairings. 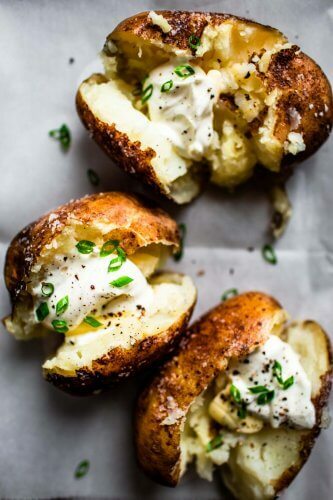 White: A crisp, clean Sauvignon Blanc with its grassy notes is an excellent companion for these nibbles. Red: A Spanish Rioja is an easy drinking, food-friendly wine, perfect with pairing with tapas. THANK YOU!! 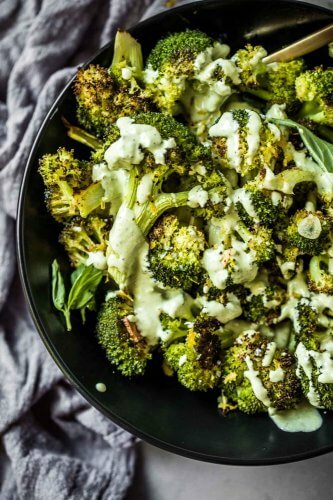 I had something similar at a hotel in L.A. a couple years back, and I think of them often… I love these peppers, I cannot wait to try your recipe! Thanks Kristina – I’ve recently seen them popping up on happy hour menus all over town. It’s fun that they’re so easy to make at home! Erin I love grilled shishito peppers! 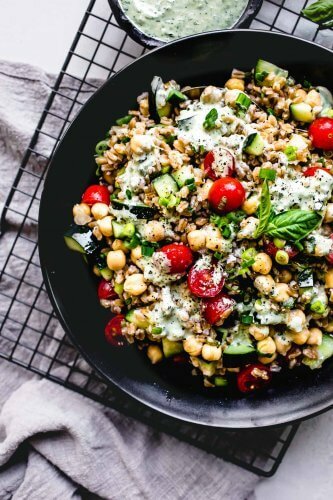 Your recipe is such a nice take on it, but I can totally recommend this awesomeness to anyone that hasn’t tried it yet! I love shishito peppers and you’re so right – eating them is a little like Russian roulette. But worth every bite. I love your simple preparation with togarashi. I’ve not grilled them, and need to try that. I always pan fry in a little olive oil. Ohmygosh I loooove shishitos and didn’t know Trader Joe’s is carrying them – now the word is out! Yours looks delicious! Isn’t it great that you can find them more mainstream now?! I LOVE Trader Joe’s! Hi Nalesniki – I believe that the texture of the peppers would be quite modified by freezing them. I wouldn’t freeze them. OMG – that opening story cracked me up! I had a similar situation once with some friends and I. I enjoyed bragging I could handle hotter food than they – it was just I didn’t have the same dish like they though I did. 😛 I’ll have to try some of these out though. They look great. I’ve never had them before, but my brother I’m sure would love them.